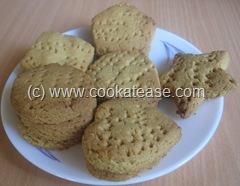 Here is Coconut Cookies using jaggery. 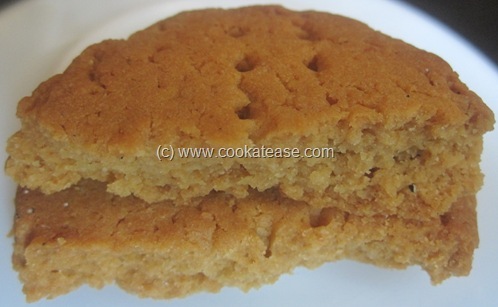 Coconut and jaggery combo gives a nice traditional touch and taste to this cookie. I love these coconut cookies with tea. 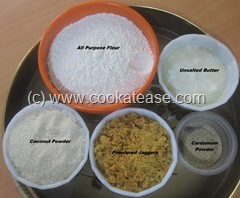 If coconut powder available in market is not fresh, it can be easily prepared at home. Grate fresh coconut, keep it in fridge for 2 days in a open container and then powder it in mixer grinder with little corn flour to get nice, fresh coconut powder. 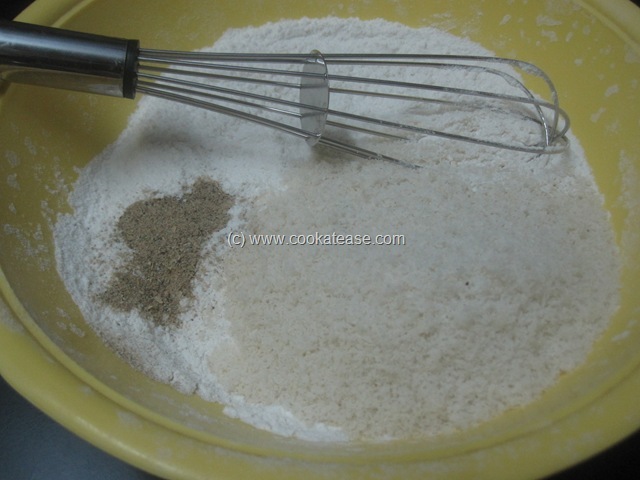 Cookies made with home made coconut powder taste very good. Coconut is known as Thengai in Tamil and as Nariyal in Hindi. 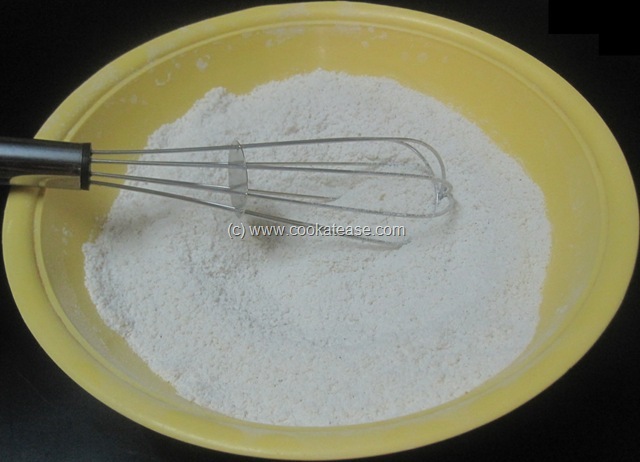 Sieve all purpose flour, baking powder and salt; add coconut powder/flour, cardamom powder, mix well and keep. Mix butter, jaggery and beat well till you get a creamy texture. Now mix this with flour and knead it to a dough like consistency; the moisture in the jaggery is enough for this; if it is too dry, you can add one or two tea spoon of milk. Roll the dough to ¼ inch thickness and prick with a fork on the surface evenly; cut into suitable shapes; arrange them in a baking tray lined with baking sheet. I baked the whole thing in one shift in two trays at 180 degree Celsius for 20 minutes and at 160 degree Celsius for 20 minutes till the cookies are golden and crisp (I used a three in one microwave oven in baking mode). Crisp and sweet Coconut (Thengai/Nariyal) Cookies are ready. 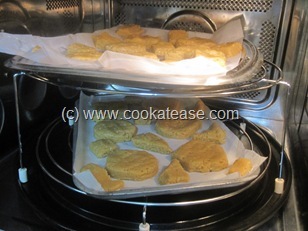 Store cookies in a air tight container. 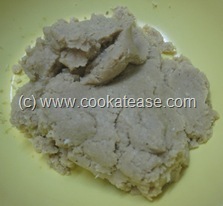 Here is the cutaway section of a coconut cookie. 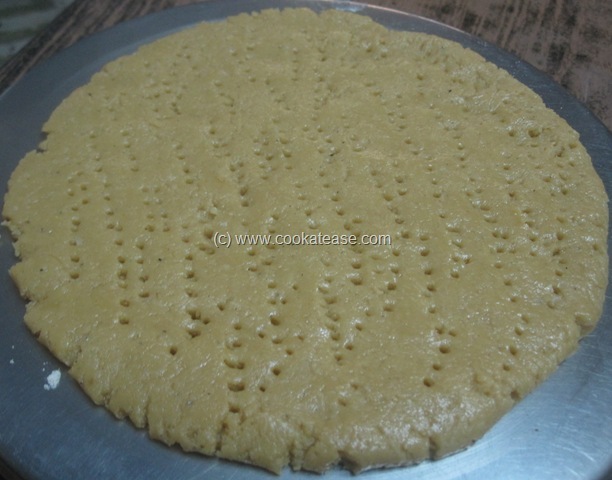 Thengai cookies looks really awesome. Like the way you used jaggery instead of sugar. 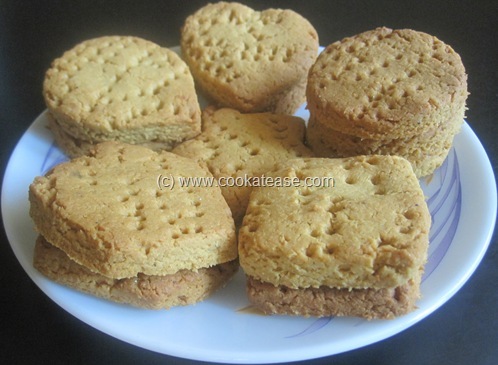 Coconut cookies looks scrumptious and prefectly baked..
very lovely cookies, add jaggary is very good idea…. How did you use the microwave in baking mode?.I heard that if food is baked in microwave it becomes like rubber is it true? would like to taste some. 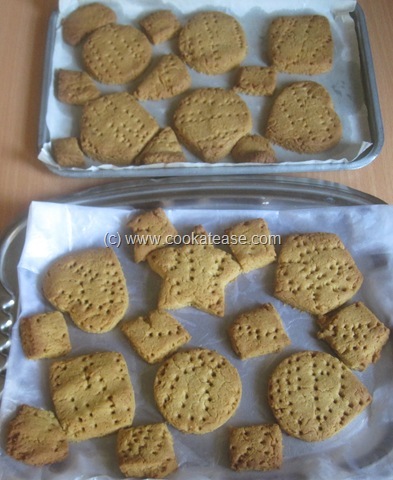 I haven’t tried cookies with jaggery, will try it. I just made your cooconut cookies. They are so delicious and yummy. My son loved it. 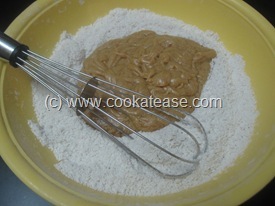 this is the first cookie i made with coconut. I halved the recipe. 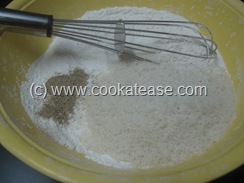 for Coconut powder, i toasted the fresh coconut flakes in oven at 200F for 20 min. 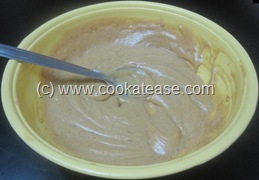 and powdered it in mixer. 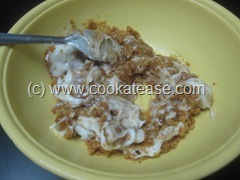 this is soo nice.. love ur step by step presentation and write up.. am sure to try it whn i have left over grated coconut..
ooh ! first time here ! amazing collection of all kinds of food.. Bookmarking some was driven to ur site first by pelapazham seeds curry !! 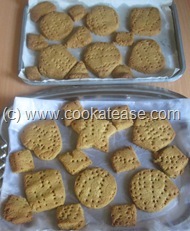 For this particular cookies, is the temp if I use an OTG also the same ? Do I need to preheat as well.. Please do reply.. many thanks ! 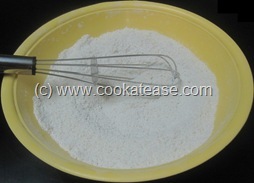 Preheating is generally necessary for baking in any type of oven. I don’t use OTG. You may refer your OTG user manual for the right temperature to bake. wooow just great made these, I microwaved the fresh coconut and groun it with cardamom came perfect heavenly just super!!! waiting for more recipes from you. 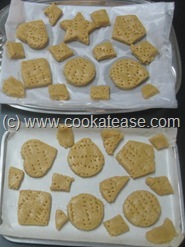 Your recipe is simply awesome but if I have to make in my microwave convection mode, how to do, my biscuit turns brown in just 4 mns and are not that soft and crunchy..I just want to know the temp and time of microwave convection. Previous post: How to Cut Mango (Mampazham/Aam) Easily ?